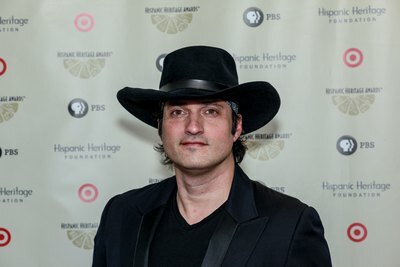 Innovative filmmaker Robert Rodriguez accepted the Vision Award, sponsored by The Hershey Company, during the 28th Annual Hispanic Heritage Awards. HERSHEY, Pa.--(BUSINESS WIRE)--The Hershey Company (NYSE: HSY) presented the Vision Award to innovative filmmaker Robert Rodriguez during the 28th Annual Hispanic Heritage Awards (HHAs) on September 17th, 2015 at the Warner Theatre in Washington, D.C.
Robert Rodriguez is a film director, screenwriter, producer, cinematographer, editor and musician and founder and Chairman of El Rey Network, the genre-busting English-language cable network. His first feature film, “El Mariachi,” was made for $7,000 and won the Audience Award at the 1993 Sundance Film Festival. It became the lowest budget movie ever released by a major studio and Rodriguez went on to write, produce, direct and edit numerous successful films including, “Desperado,” “From Dusk Till Dawn,” “The Faculty,” and the “Spy Kids” franchise. Milton Hershey made his mark hiring employees from diverse backgrounds from the earliest days of the company. He saw diversity of perspectives as a source of strength. Today, Hershey has teams of people throughout the organization with unique talents and diverse perspectives, which drives innovative thinking and success. “Hershey is at its best when every member of our team believes they can help us find new paths to growth and success,” added Idrovo. The Hershey Company (NYSE: HSY), headquartered in Hershey, Pa., is a global confectionery leader known for bringing goodness to the world through its chocolate, sweets, mints and other great-tasting snacks. Hershey has more than 22,000 employees around the world who work every day to deliver delicious, quality products. The company, which has more than 80 brands around the world that drive over $7.4 billion in annual revenues, includes such iconic brand names as Hershey's, Reese's, Hershey's Kisses, Jolly Rancher, Ice Breakers and Brookside. Hershey is focused on growing its presence in key international markets while continuing to build its competitive advantage in North America. Additionally, Hershey is expanding its portfolio into categories beyond confectionery, finding new ways to bring goodness to people everywhere. At Hershey, goodness has always been about more than delicious products. For 120 years, Hershey has been committed to good business by operating fairly, ethically and sustainably to make a positive impact on society. This means contributing to a better life for its employees, consumers, communities, and, ultimately, creating a bright future for children in need. This commitment is exemplified by Milton Hershey School, established in 1909 by the company's founder and administered by Hershey Trust Company. The children who attend the school receive education, housing, and medical care — thriving as direct beneficiaries of The Hershey Company's success.